No. 54 on the High Street dates to the late-18th or early-19th century. It isn't particularly distinguished but the plain facade is at least enlivened with a few classical details. It is a Grade II listed building and the listing description suggests that the facade could possibly mask an earlier structure. The building is spread over four floors with quoins at each corner of the facade and with a bracketed cornice under the eave of the roof. One attractive detail are the arched pediments above the two first-floor windows. The windows on the other floors all have architrave surrounds. Presumably the glass was originally divided into a number of lights with small glazing bars before they were replaced with the present large-paned Victorian sashes. All of the windows rest on two little brackets under the sill and each floor is demarcated by a thin band running across the width of the facade. 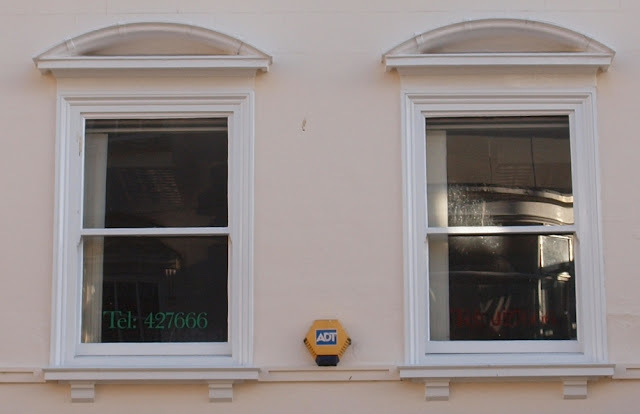 The top floor windows are curiously squashed, suggesting that there might indeed be an older structure behind the facade which was designed to accommodate the pre-existing layout! For once the modern shop front is subdued although it's unlikely that anything of interest lies inside. A building with a very similar facade, without the arched pediments but with the same squashed top floor windows, stood next to No. 54 until it was replaced with the current Tudor Revival property at No. 53 in the first decade of the 20th century. In fact an examination of the roofs of both buildings suggest that Nos. 53 & 54 were built at the same time, possibly as a pair, and that only the facade of No. 53 was replaced leaving the rest of the structure intact. Dating to the early 20th century, this interesting and attractive building is a relatively late example of the Black-and-White Revival style of architecture more commonly associated with historic cities like Chester. It was built c1905 and replaced an earlier 18th century facade closely related in appearance to the still-standing building at No. 54. It's possible that evidence of the earlier building still survives inside. At first glance the black and white facade of No. 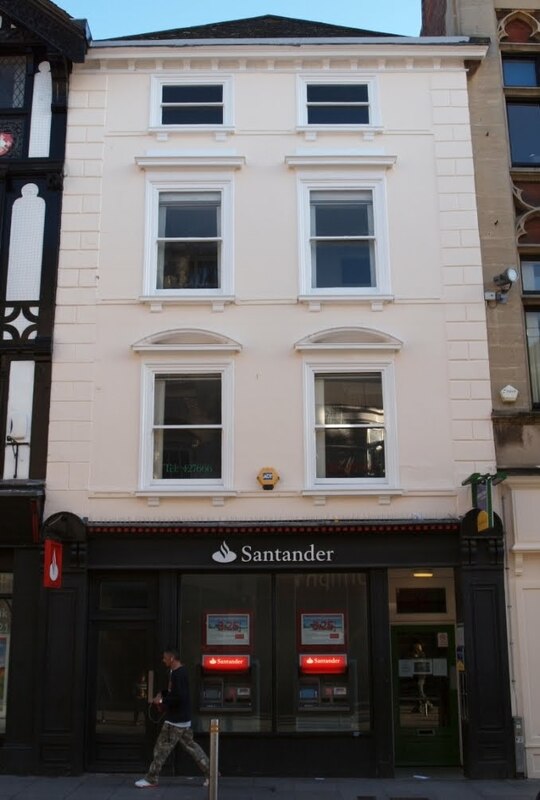 53 looks relatively plain, constructed on four floors, two bays wide with a large gable overlooking the street. But closer examination reveals a multitude of fascinating details. The architect clearly looked to the Gothic splendour of Exeter Cathedral as his inspiration. 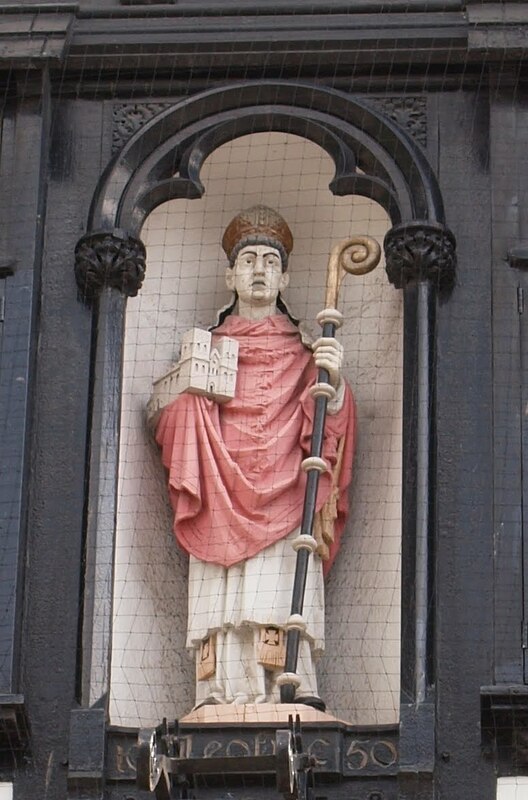 In a cusped niche between the windows on the second floor is a large wooden statue of Leofric, the first Bishop of Exeter below right, and the date 1050, the year in which Leofric was enthroned at Exeter as bishop in the presence of Edward the Confessor. The statue clutches a small model of the Norman cathedral in his left hand. The ecclesiastical theme is continued in the small shields on the third floor, one of which depicts the crossed keys of St Peter against a sword, the heraldic symbol of the Bishops of Exeter below left. Both of the shields are surrounded by intricately carved panels. High up on the top of the gable is a large finial similar to the Gothic ballflower pinnacles of the Cathedral itself. Even some of the black timbers form the outline of cusped Gothic arches against a white background. 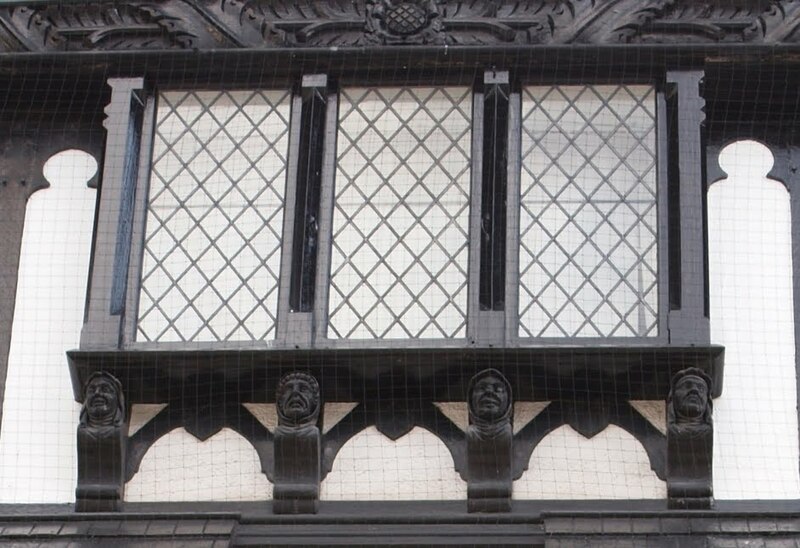 Between the windows at first floor level is a leaded stained glass window depicting the coat of arms of Exeter, a three-towered castle flanked by pegasus supporters. Where the second floor jetties out over the first floor it is supported by four brackets carved with imps and devils. The third-floor oriel window is also supported by four carved brackets, each depicting a human head in medieval costume. A frieze, deeply carved with foliage, runs above the oriel window across the entire facade of the building. 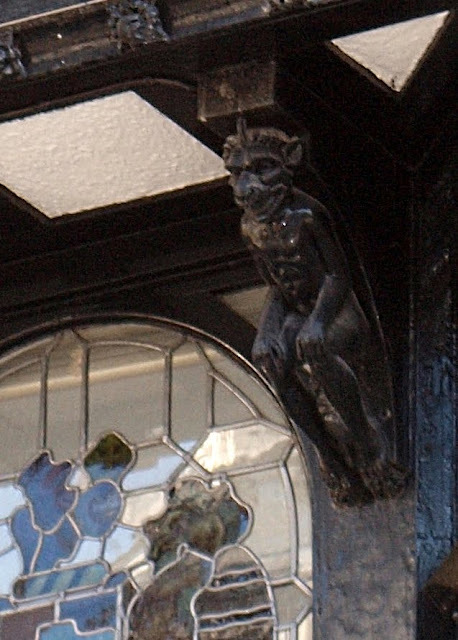 Even the bargeboards of the gable end are elaborately carved, and for once the modern shopfront is a tasteful addition in keeping with the rest of the property. The references to Exeter's ecclesiastical past make No. 53 a unique building, fully deserving of its Grade II listed status. It is unfortunate that its impact on the overall street scene is marred by the grim presence of the 1960s rebuilding of Nos. 50-52 to its immediate left. No. 53 also provides an interesting 'What If?' scenario concerning the sad fate of the city following the devatastion of World War Two. According to Thomas Sharp, the planner behind much of the city's post-war reconstruction, one possible option for rebuilding lay in what he dismissively referred to as "medieval trappings". In his 1946 publication 'Exeter Phoenix', Sharp wrote that "many citizens" in the city envisaged Exeter rebuilt in the style of Chester, which still has the most notable collection of Black-and-White Revival architecture in England. Sharp specifically stated that "the example of Chester is often quoted" and continued: "the blitzed sites of shops display brightly-coloured designs for the 'medieval' facades which will mask the selling of draperies and the dispensing of afternoon tea...Exeter has so long regarded itself as 'medieval' that it is almost inevitable that it can only think of itself in 'medieval' dress". Sharp, perhaps disingenuously, stated that the reconstruction of Exeter in a Tudor Revival style was not only "likely" but "quite certain, unless some policy to the contrary is laid down". In reality there was very little prospect of the city being reconstructed in such a fashion in 1950s Britain. Such a reconstruction was anathema to Sharp. Rebuilding Exeter along the architectural lines of Chester would, he believed, have been "lamentable" and could only produce "meaningless and incongruous" effects which would look "contemptible...To attempt to rebuild 20th century Exeter with medieval forms would be the work of a generation that is visually blind and spiritually half-dead". It is the greatest irony that the post-war buildings which eventually arose across the bomb-damaged city were of such pitiful quality, of such meagre architectural value that they are now being pulled down, demolished and rebuilt (although it should be added that their 21st century replacements are hardly a great improvement). No. 53 survives today as an indication of what at least parts of the damaged city might've looked like if the local authority had indeed opted for a historically-informed reconstruction of Exeter. 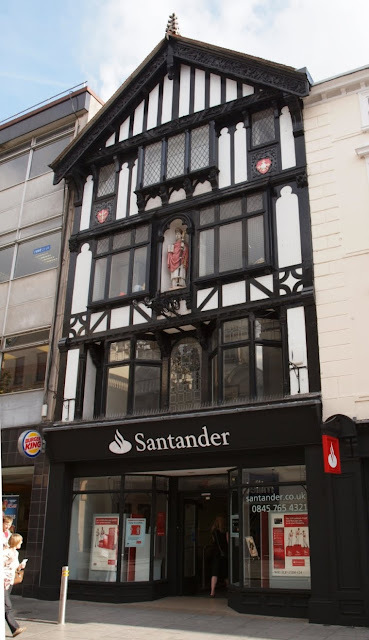 As architectural historian Gavin Stamp wrote in 2007: "Would Exeter really have been any worse had it been rebuilt in the fake-medieval manner that Thomas Sharp so feared? The Cathedral remains glorious, but the city is certainly no longer a jewel."